GINNY WAS ADOPTED NOVEMBER 26, 2008! Ginny never made it to Petfinder. She was adopted only an hour after she came into foster care. 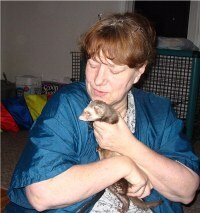 Farrah/Sprite's mom had told us just a few weeks before that she wanted to adopt another ferret. When we heard about Ginny, a very sweet ferret who had been found wandering the streets of Trenton and needed to get out of the Trenton shelter by the Wednesday before Thanksgiving, we took her in, notified Farrah/Sprite's mom, and she came right over to adopt Ginny. 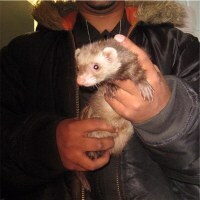 Now Ginny will have a ferret sister and two cats to play with. She played briefly with the cats in her foster home and had a blast.